Football World Cup - 2018 on the eve of: eleven cities in Russia are ready to accept both the football elite of the planet, and the flow of fans. According to forecasts, this stream will beat the previous record of Brazil - it is expected three million tourists after one Brazilian million. Let's see what our cities have prepared for these millions. A global event requires special security measures. Therefore, if you are planning to come to the championship cities yourself, remember the temporary tightening of the registration rules. It operates from May 25 to July 25 and obliges each city guest to register for temporary registration through the MFC or territorial bodies of the Ministry of Internal Affairs no later than three days from the date of arrival. To register it is necessary personally, having submitted the application, the passport and the document proving temporary residence, for example the contract of apartment rent. Registration in the form of registered letter or electronic form does not work. It will be easier with hotels - they will take care of your registration. For fans with tickets to the matches it's even easier if after the tickets they received a useful document - a fan's passport, or FAN-ID. He will allow free movement between the cities of the championship, and in the cities themselves, and in general will become the main identity for the entire time mundialya. Full information about the fan's passport and how and where to get it, you will find on the official website. Free tickets for trains between the cities of the World Cup 2018 can be booked on the site, creating a personal cabinet. Fans will carry 728 luxury trains - this is more than 440 thousand seats, much of which has already been sold. Free flights will not be, but the benefit for the fans still is: the Aeroflot action allows you to buy a ticket for a plane at a symbolic price if you fly to the game with the participation of the Russian team. The rest of the matches are normal prices. The capital of Russia will become the capital of the championship: in Moscow, in the Grand Sports Arena of the Luzhniki sports complex, the match of the opening of the championship and the final match will be held. Moscow will also be the main venue for the guests of the championship. Of the nearly 180 hotels officially recommended by FIFA, 74 are located in the capital. For Luzhniki this is not the first event of this magnitude - in 1980, the Olympics were opened at the Big Sports Arena, and then the Olympic Bear flew away from there. To the championship arena completely reconstructed inside, preserving the historic facade. New technologies have made it possible to transform the "stuffing" of old walls. The field of the Big Sports Arena became square and purely football. Lawn on the field is real, herbal. The sunlight necessary for such a lawn passes through a transparent roof, which is 14 meters higher. There were new stands, the angle of their inclination was increased, there was no longer a "blind zone", in which 10% of spectators had previously fallen. The stadium now seats not 78 thousand spectators, as before, but 3 thousand more. In March 2018 the updated Grand Arena was recognized as the best sports arena of the world by the version of professional architects on the authoritative English portal StadiumDB.com. 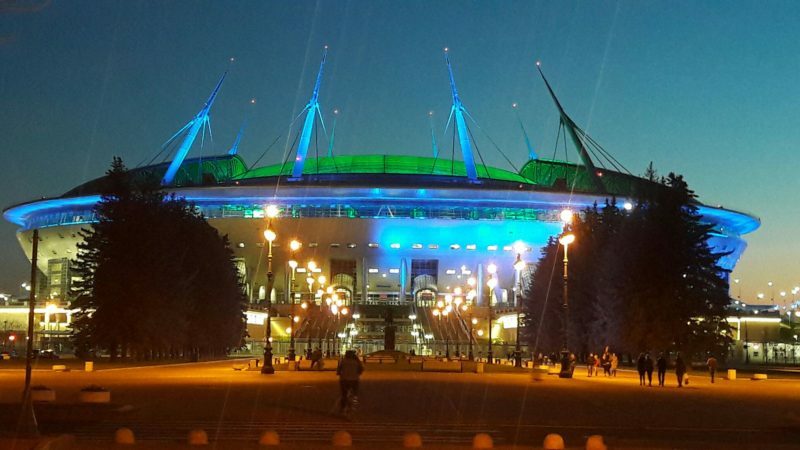 The second Moscow stadium of the World Cup 2018 - "Spartacus", or "Opening Arena" (the first name will be used during the championship). This is the long-awaited home stadium of the legendary FC Spartak, built in 2014 in the metropolitan area of Tushino. It will host five matches of the championship: four games of the group stage and one match of the 1/8 finals. The main fan zone of the championship will be a playground on Vorobyovy Gory, on the territory of Moscow University. It is designed for about 40 thousand people. In addition to the official fan zone, thematic football grounds are organized in different parks in Moscow. In "Charge", for example, fans will be able to make a multimedia "Flight over Russia" - the so-called new attraction. And in Sokolniki, among other things, they promise to install a giant vuvuzel, memorable according to one of the previous championships, in order to note its goals with sounds. A special excursion program has been developed for the guests of the championship. First of all, it's excursions to the stadiums - and in the Luzhniki Stadium, and at the Spartak base the fans have something to see. Both stadiums will be connected in a single route, adding to it the stadium "Dynamo". A special historical excursions will present guests to the capital of Russia. This will help the mobile application "Discover Moscow", which offers users three routes of different lengths along the main sights of the city center since the Kremlin. Podmoskovnye tours will show guests the championship Sergiev Posad and the laurel, the ancient Kremlin Kolomna and Dmitrov, the house-museum of Tchaikovsky in Klin and New Jerusalem on Istra. On the Moscow roads, for the convenience of the fans, dedicated transport lines were made. They will be involved in match days, three hours before the start and after the end of the game, for the sake of improving security and speed of movement around the city. In St. Petersburg, the main goal of the 2018 World Cup guests will be the new stadium "St. Petersburg" on Krestovsky Island. It is quite far from the city center and is located away from traditional sightseeing routes. Officially registered fans will be able to get to it free of charge on shuttles, including directly from Pulkovo airport and from Vosstaniya square, where the Moscow railway station is located. Places of departure and routes are indicated on the diagrams of the St. Petersburg metro. Navigation in the metro is duplicated in English, and the functionality of ticket machines is also available in German, French, Spanish and Chinese. The city's hotels are ready to accept the football stream. In addition to the usual hotels, mini-hotels and hostels, the organizers of the championship are going to equip several campsites on the outskirts of the city - for fans who will come by their own vehicles. They are promised to announce their specific location later, before the events begin. On the central streets of St. Petersburg, tourists who do not even orient themselves in the city will not be lost: a special support service for fans and the city service "I know the city" (young people in blue on segways with the corresponding inscription) are ready to help. The St. Petersburg Committee for Tourism has developed ten excursion routes for the guests of the World Cup. Among them - an excursion to Peterhof, a tour of the main city attractions, along the rivers and canals, along the roofs, a gastronomic excursion along Rubinshteina Street, a children's pedestrian route "Cats in Petersburg". Of course, fans will see drawbridges. Do not go farfrom the stadium on Krestovsky, you can go on an ecological tour of Elagin Island. A special route is Football St. Petersburg. He presents the history of football in Russia and the history of the club Zenit, the main city football venues: the stadiums Dynamo, Petrovsky and St. Petersburg, the Specific Park, the St. Petersburg CCM. The official fan zone will open on Konyushennaya Square - this is a playground for 15 thousand spectators. The concert program with participation, for example, Zemfira, and every possible amusements within the limits of festival of fans is conceived - all it is free-of-charge. The time of the World Championship coincides with bright non-football events that will join the general program. June 12 will begin the Festival of Flowers - a floral parade will fill Nevsky Prospect with bright colors and fragrance. June 21 in the Summer Garden will open the festival "Imperial Gardens". July 7 will be a traditional Day of Dostoevsky, which is just due to the championship moves to New Holland. Visiting the Hermitage and traditional museums probably does not rhyme with football excitement, but the Hermitage participates almost directly in the championship. Already known to football fans the white Hermitage cat Achilles will again predict the outcome of the games.